Yes, it really is true. You can get money for nothing. Well, for almost nothing. You generally have to perform some task: click a button, view an ad, visit a website, complete a survey. Sometimes it’s an enjoyable task, like playing an online game. Often it requires just a few seconds every hour or so. 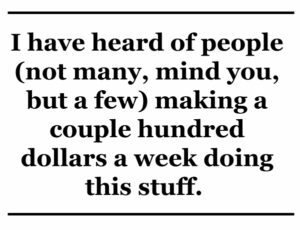 The amount of money you get is tiny — generally fractions of a cent at a time — although there are ways you can increase your take, like betting the free money that you make or referring other people to the site. And if you keep at it long enough, you may actually end up with enough money to pay for a nice dinner. If you get really, really, really lucky, you could even do much better. But I wouldn’t count on that last option. 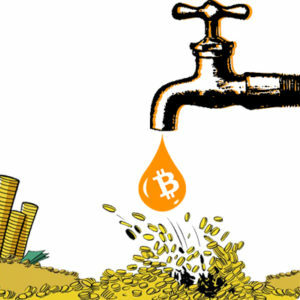 The free money portals we’re talking about here are called “bitcoin faucets.” Or more generally nowadays, because most of them go beyond strictly bitcoin, “cryptocurrency faucets,” although for simplicity we’ll just call them bitcoin faucets here. And they really are exactly what they say they are: faucets that spit out bitcoin. You go the website, sign up with your bitcoin wallet address, click a button, and receive a tiny bit of free bitcoin or other cryptocurrency. Most faucets have time limits on how often you can claim your freebie, generally once every hour or so. You can just keep the website open or minimized on your desktop while you work or do other things, then bring it up every hour to click and claim again. Easy-peasy. Some sites even have timers that will play a sound when you can claim again, just so you don’t forget. There has to be a catch, you say. Well… not really. The sites sell advertising. The free crypto is a come-on to get people to the site to see the ads. The site owners are hoping that they make more money from the advertisers than they give away in free bitcoin. Unfortunately, that mostly doesn’t happen. If you look at a single web page only once an hour, just long enough to click a button and watch your balance go up a tiny bit, then go back about your business — well, that doesn’t bring in much advertising money for the site owner. Especially if you’re pushing aside the ads so you can get to the button to click. So the site owner has to design other ways to keep you busy on the site: new things to do, new things to see, new pages to click on. Gambling games are popular: you bet a little bit of your free money on a dice roll or a random-number wheel. If you win, you get a little more money. If you lose, the site takes some of yours back. In the meantime, you also see a couple more ads. Some sites have “pay-to-click” advertising. You click on an ad or watch a video and receive a payment when it’s finished. The site gets a commission, too. There are surveys you can fill out, apps you can install on your phone, offers (some free, some you actually have to pay for) that you can sign up for — if you can think of it, people are paying little bits of cryptocurrency to have you do it. Some of these faucet sites, gathering all of these activities together, could keep you busy for hours, literally. Some sites even have full-fledged, ongoing interactive games where you build a city or a farm or a factory and earn bitcoin as you go along. Most also have referral programs, where if you refer someone to their site, you receive ongoing commissions based on that person’s usage. 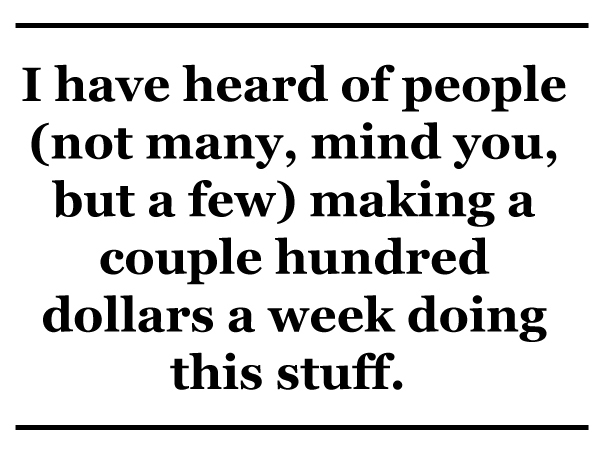 I have heard of people (not many, mind you, but a few) making a couple hundred dollars a week doing this stuff. I have no clue how many hours a day they devote to it, but I guess if you can make it work, it beats working. So How Much Do They Pay You? But before you go quitting your day job, let’s clarify exactly how much “money” we’re talking here. And for that, you need a quick lesson in how bitcoin is measured. A single bitcoin is broken down into units called “satoshis,” named after the (pseudonymous) person(s) who created bitcoin in 2009, Satoshi Nakamoto. 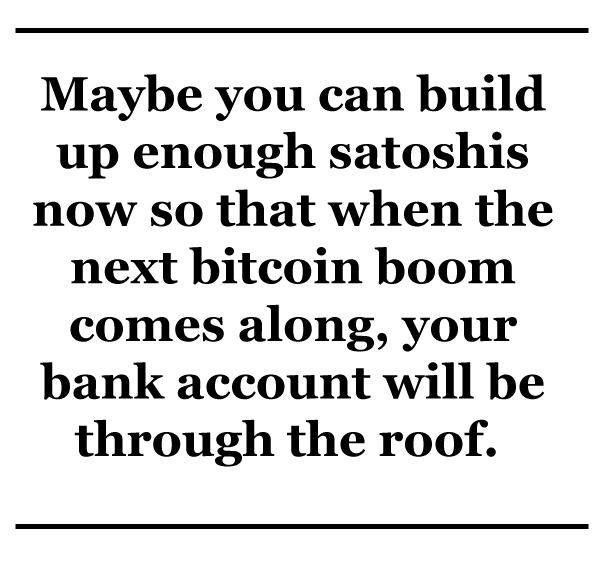 A satoshi is one one-hundred-millionth of a bitcoin — that is, 0.00000001 of a bitcoin. As I write this, the price of a bitcoin is just under $3,500. That makes one satoshi worth $0.000035. In other words, right now it takes 286 satoshis to make one U.S. cent. These bitcoin faucets generally pay you in satoshis. Twenty or thirty satoshis. A couple hundred satoshis. Sometimes, for time-consuming tasks like surveys, you might get paid several thousand satoshis, maybe even as much as 50 cents’ worth. So in other words, you ain’t gonna strike it rich overnight. The highly complex, build-your-own-city-type games generally offer bigger rewards, because as you progress in the game, your buildings/farms/whatever begin producing bitcoin automatically. Thus, sort of like compounding interest, your balance grows on its own, 24/7, even while you sleep. You generally have to tend to your city (or whatever) in some fashion, and probably re-invest some of your balance back into improving it. But the couple stories I’ve heard of people making decent sums of money from faucets have come from these types of games, and also from the referral programs which obviously also earn you money 24/7, as long as your referrals continue to use the site. Often the faucets will not pay you directly in satoshis, but instead in their own type of coin or token, whose value is actually denominated in U.S. dollars or some other national currency. Then when you withdraw your balance, it is converted into bitcoin (or some other cryptocurrency) at the then-current exchange rate. For example, I may operate a site where I pay out in EdTokens, with each EdToken worth one U.S. cent. When you click a button, you receive 20 EdTokens. That means you’re getting $0.20 each time — but that $0.20 will buy you more or less bitcoin, depending on the fluctuations in the price of bitcoin over time. Say on the day you want to cash out, you have 4,000 EdTokens in your account. At $0.20 each, those 4,000 EdTokens are worth $800. (Not a bad haul!) If the price of bitcoin that day is $3,200, you’ll get 0.25 of a bitcoin (25 million satoshis) for your $800. But if the price of bitcoin that day is $5,000, you’ll only get 0.16 of a bitcoin (16 million satoshis) for the same $800. As you can see, unless the site pays you directly in satoshis, the number of satoshis you receive will be higher or lower — sometimes significantly — depending on the price of bitcoin. You’ll make the same amount of actual dollars either way. But if you’re trying to build up a stash of bitcoin, the price fluctuations could work either for or against you. The same goes for sites that actually do pay you in satoshis, but that tie the value of their prizes to the dollar or some other currency. As the value of bitcoin goes up, the number of satoshis in the prize goes down, and vice versa. Damn good question. As with everything else in the world, some of them are and some of them aren’t. You need to be careful and check them out. Also — an important philosophy I tend to keep in mind — is do not deposit any cryptocurrency to the site. They are supposed to be giving you money, not vice versa. There may be a special circumstance when you want to make a deposit. But make damned sure you trust the site and you know what you are doing before you so so. Many sites will allow you and encourage you to make deposits, and there are some good reasons for this. Some sites actually pay you interest on the crypto that you hold there, so it’s beneficial to you to deposit. Or maybe you want to make bigger bets in the gambling games — you can deposit more coin. And so on and so forth. Lots of legitimate reasons for you to send them your money. And if you want to send them your money, that’s up to you. But if you do, remember that you do it at your own risk. Once the coin is on their site, it is under their control, not yours. 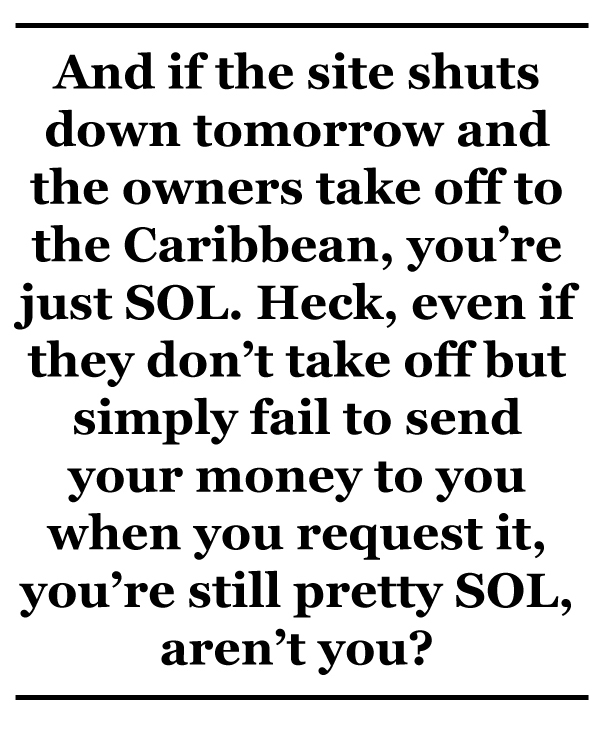 And if the site shuts down tomorrow and the owners take off to the Caribbean, you’re just SOL. 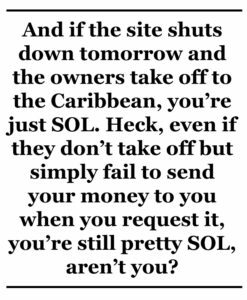 Heck, even if they don’t take off but simply fail to send your money to you when you request it, you’re still pretty SOL, aren’t you? So check out the site ahead of time. Read online reviews. If the site has an online chat, hang out there for a bit and see what kind of comments the other users are making. Are they complaining, or are they complimenting? Do the site’s owners/managers also hang out in the chat (i.e., are they accessible)? Can you contact customer service? Build up a little free coin at the site, then withdraw it. See how quickly it gets deposited to your wallet, and how few (or how many!) problems there may be in doing so. Many sites are quite legit and are just trying to make an honest living. Their operations and customer service are completely on the up-and-up, and you should have no problems. Other sites are complete scams, just waiting to steal your money. Many others fall in between — honest sites that maybe hit a bump in the road or are run badly, and could unintentionally go down with all of your money. Intentional or otherwise, it’s still your money they’re taking with them. So be careful. 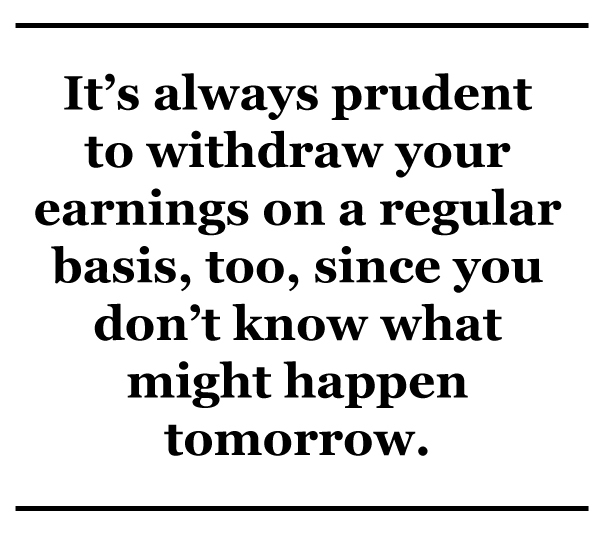 Even if you don’t deposit, it’s always prudent to withdraw your earnings on a regular basis, too, since you don’t know what might happen tomorrow. The only time I’ve deposited bitcoin to any faucet site was one time when I wanted to get my balance up to the minimum necessary to withdraw it. So — I send them a little extra coin so the balance goes above the minimum, then I withdraw the whole thing. This was a site I had withdrawn from previously, so I was pretty confident of their honesty during the short stay my extra coin had there. Otherwise — they pay me, I don’t pay them. In addition, be aware that most faucet sites do have a minimum balance you must meet before you can withdraw. Know what this balance is, and how soon you’re likely to reach it. Because your earnings are trapped at the site until you reach that minimum. 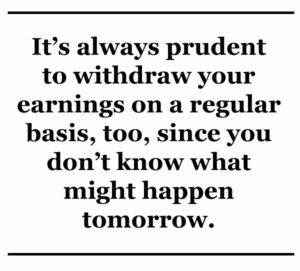 And though they might be tiny earnings, they’re still your earnings. If you delve into the world of bitcoin faucets — or of bitcoin in general, for that matter — you are bound to come across the topic of bitcoin mining. Mining is the process of literally creating bitcoin (or other cryptocurrency) in return for work. It should probably actually be called “minting” rather than “mining,” but I didn’t come up with the terms. But it is the process through which bitcoin is created. The short, oversimplified version: The entire process through which a cryptocurrency is created, transferred, and stored, and through which all of these transactions are recorded, requires a massive amount of mathematical computation. These computations not only keep track of all the transactions, but they also digitally sign, seal, and verify everything. The computations are conducted by an entire network of computers, connected together voluntarily, and checking each others’ work. The programming is designed such that, after a certain number of computations, a new coin springs into existence and is awarded to the computers — the “miners” — who did the actual computations. The process of doing the computing is called “mining” the cryptocurrency, because it is through this computing that new currency is brought into being. What’s involved in mining a specific coin depends on the nature of the programming which underlies that particular coin. Because of how it was originally designed, bitcoin mining has become extremely computationally intensive — it now requires massive amounts of computing power to process bitcoin transactions. One solution to this is to “offload” some of the computations to networked computers — that is, to allow not-so-powerful computers to hitch up to the main computer and share some of the computing load. This is where you, and the bitcoin faucets, come in. 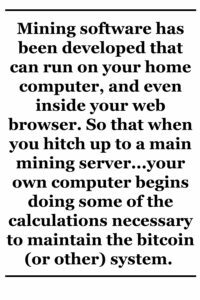 Mining software has been developed that can run on your home computer, and even inside your web browser. 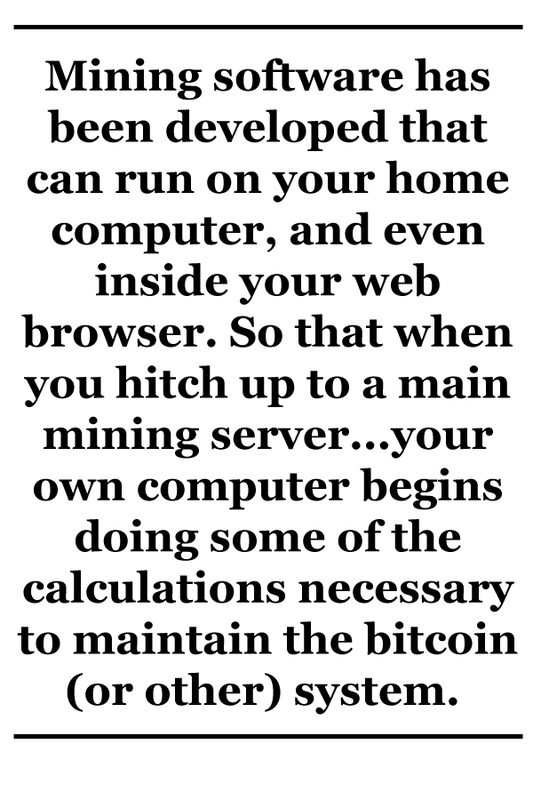 So that when you hitch up to a main mining server — either by running a program on your computer and connecting to the server, or simply by opening your browser on a given web page — your own computer begins doing some of the calculations necessary to maintain the bitcoin (or other) system. And in return for this, you are generally given a (small) share of the profits. So here is another way for the bitcoin faucets to get you to stay on their sites and use their services. They set up a mining hub and invite you to join in. They pay you your share of the profits, while keeping a little piece for themselves. This is actually not a bad way to make some money, especially if you have a decently powerful computer. But you have to be careful because, if your computer is using all of its processing power to mine cryptocurrency, then you will find it hard to do anything else. Many mining programs allow you to “throttle” the mining, so that it can run in the background while still allowing you to use your computer for other things. And then when you leave the computer for awhile, you can turn the miner up to full throttle. But I’ve learned my lesson. Slow and steady wins the race. The journey of a thousand miles begins with a single step. Drop by drop the water pot is filled. You get the idea. A few minutes a day and a few pennies a day doesn’t seem like much, but those pennies (satoshis) can add up. Especially now, when the price of bitcoin is low. Stock up on satoshis now, so when (if!) the price goes back up, you’re compounding your gains. So… Here are a few places you can try getting wet underneath a bitcoin faucet. There are not a lot of places on this list, but that’s because I’m only listing sites that I’ve actually tried successfully — that is, I’ve opened an account, earned some free bitcoin, and (most importantly!) I’ve actually withdrawn the bitcoin into my wallet successfully. That says to me that the site is fairly stable and legitimate — you can get your money out. I’m sure there are lots of other good sites out there, but I haven’t tried them (who has time??!! ), so I’m not going to list them here. For any site — including the ones I list here — you need to make sure to do your own due diligence. And keep it light. Earn a little coin in your spare time. No big investments, no falling for scams. Just a little fun. I will also note, in the interests of full disclosure, that these links are affiliate links. In other words, if you use these links to join these sites, I get a little more spray out of the faucet, so to speak. None of that comes out of your share, so I’d appreciate it if you could use the links. Thanks. Faucethub is not only a massive collection of almost every kind of faucet you can imagine, along with a mining page, but it’s also what they call a “micropayment platform.” What that means is that Faucethub actually manages the payments for many other sites. Instead of the sites sending the payment directly to you, they send it to your account at Faucethub. You then collect payments from multiple sites at Faucethub and withdraw them all together when you are ready. So an account here is a good idea, whether or not you actually use their faucets, because some of the other faucets will probably want to pay you here. But while you’re here, you might as well use the Faucethub faucets, too. FreeBitco.in is really the site that got me started on all this. (And if I’d kept up with it every day over the couple of years that I dropped it, I’d have a lot more money now, because they paid a lot more satoshis then…) They are a fairly simple site: a “lucky number” faucet and a “multiply” gambling game are the two main features. But there’s also a weekly lottery, reward points, interest on your balance over 30,000 satoshis, a referral program, and more. My big problem with them is that they’ve cut the value of their minimum prize drastically — and the minimum prize is what you win most of the time. But I still go give it a click most every hour. Cointiply is a relatively new site, but they seem to me to be one where you can get a much better return for your time invested. For the basic faucet, you spin a wheel and get a prize depending on the number that comes up. For every consecutive day you make a spin, your bonus increases. They also have a wide variety of pay-to-click ads, surveys, trials, games, videos, and so forth, all which can pay halfway decent amounts of coin. Plus the ever-popular gambling “multiplier” game (which you can actually beat if you’re careful — but you can lose big if you’re not). They’ve had some problems recently, but came through them honestly and transparently and so gained the respect of many users, and they’re planning to add new features in the near future. Swift Mining is a mining site where you can use your web browser to mine a wide variety of cryptocurrency. They are not really a “faucet,” because mining is the only thing they do. 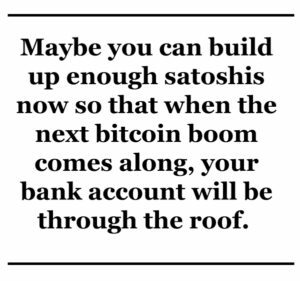 But their mining is set up well, and you can withdraw as little as a single satoshi with no fee. Not a bad way to let your idle computer earn you some coin with relatively little risk. If you’re a wee bit techie, you can set up their command-line miner and get even more mining power than the browser-based miner will give you. Update, March 5, 2019: For a couple of weeks after I made this post, Swift Mining seemed to have been having a lot of technical issues: the site would be down, they would run out of bitcoin to make payments, etc. They always fixed the issues, and the site managers seemed quite accessible, open, and honest, but I just kind of got tired of dealing with it, so I stopped using them. But I did find another mining solution which seems to work and pay really well. It is CryptoTab Browser, which has the dual benefit of being both a bitcoin miner and a web browser — i.e., you can use it to browse the web and be mining crypto at the same time. CryptoTab does not slow down or overheat your computer, and it is basically a version of the Chrome browser, so you can import your bookmarks and essentially do everything just like you are used to doing. Or, if you are like me and don’t want to give up your current browser, you can just run a single window of CryptoTab, minimize it, and use your regular browser for web browsing. They have an affiliate program that pays to ten levels, so if you are a network marketer, you can probably make lots of money. This is the best mining solution I have found so far. Update, March 13, 2019: Here is why you need to be careful: The Swift Mining site is shutting down, mostly for financial reasons, but also because of buggy third-party software they are using. I apologize for the bad recommendation, although it does seem they tried, and they are giving notice ahead of time, rather than just shutting down with everyone’s money. Best option now that I have found for mining is the CryptoTab browser. Working great, and I have withdrawn from it already. Anonymous Ads is also not strictly speaking a faucet site, but is instead a bitcoin-based advertising network like Google’s AdSense network. If you have a website, you can run ads on your site and get paid in bitcoin — so it sort of acts like a faucet, paying you money as people visit your website, and you don’t have to do anything at all except set up the ads the first time. The site is not a standard pay-per-click or pay-per-impression network, so be sure to read the help information so you understand how the payments are allocated. If you’re an advertiser, you can display your ads on the network and pay for them in bitcoin. The “anonymous” part of the name refers to the fact that you can, if you like, advertise anonymously — you only need your bitcoin address to sign up. So there you have it. Free money for the asking, all it requires is a little patience. Do you have experience with bitcoin faucets? Leave a note in the comments.